We sealed the deal in France! Leading all the way through the game against Bourges we managed to beat them a second time, punching the last ticket available in the FINAL4! Johannes got the game going with a quick lay-up, to which Amanda answered back with a three-point play giving us the early lead (2-3). Then Plouffe and Candice exchanged baskets, to which Yvonne added a lay-up. Bourges equalized with a lay-up, and then they even took the lead with a double by Ouvina (5th minute 7-9). Not for long, though, Aleks tied it up again with a quick bucket from inside the paint. After that Ouvina and Yvonne both hit doubles, and then Chartereau drained a demoralizing three, to which Rupert added a double, forcing our first time.out in the game (8th minute 16-11). Tina and Queralt made close shots, to which Raincock-Ekunwe answered back likewise, and then our Serbian center converted two shos from the free throw line to reduce the gap between the sides to a single point. What's more, from the next offense she even gave us a lead with a nice hook shot setting the score for the quarter (10th minute 18-19). After a couple of missed attempts from both sides Aleks started scoring, she made a very difficult double from under the rim, to which Johannes answered back from behind the three-point line (12th minute 21-21). Then came a three-minute scoring drought filled with mistakes on both ends, to which Tina put an end with a double, and then it was her again who exchanged buckets with Johannes for two (16th minute 23-25). Then Plouffe scored twice from inside the three-point line, to give Bourges a small lead, but then Aleks answered back to that with five consecutive points to give us the lead and force Olivier Lafargue to call his team to the bench (18th minute 29-30). After the break Aleks and Candice were able to score again, and Bourges couldn't crack our defense, hence the five-point lead at half-time (20th minute 29-34). Zs�fi began the third with one of her signature mid-range jumpers, to which Raincock-Ekunwe answered back with a double inside the paint. Then Candice and Raincock-Ekunwe both hit incredible shots. A minute later it was our world champion again who scored, this time off a spin move inside the paint (25th minute 33-40). After that Amanda and Raincock-Ekunwe were able to score, the former made a double, while the latter drained a three, to which Zs�fi answered back with two successful shots from the free throw line. Then Amanda added a double to our total, increasing our lead into the double-digit region for the first time in the series, and forcing Bourges's next time-out (27th minute 36-46). Coming back from the short pause Amanda also converted the and-one, and then Johannes drew three foul shots, but she made only two of them. Then Godin and Zs�fi scored, followed by a double from Raincock-Ekunwe. Candice restored the ten-point advantage with a lay-up after running down the court with a steal. The final score for the period was set by two quick baskets from Johannes and Michel (30th minute 45-51). The final stage of the game began with Candice making one of two from the free throw line, to which Tina added a lay-up off a spin move. Then Yvonne hit both foul shots awarded. (32nd minute 45-56). After that Sharp converted two shots from the free throw line, to which Tina answered back with a double. Chartereau and Candice exchanged buckets, Chartereau hit one from downtown, and our American power forward buried a double, to which Michel added a double for the home side. Tina was unstoppable, though, she dropped another double, and then made one of two from the line (35th minute 52-63). Then the French kept making it rain from outside, Chartereau drained another triple for Bourges, forcing Roberto Iniguez to call his next time-out in the game (55-63). After the short break Raincock-Ekunwe scored a double, to which Queralt answered back woth two free throws, and then Aleks hit an incredible triple from way outside. Then Ouvina scored for two, to which Tina answered back with one of two from the line (38th minute 59-69). In the last two minutes the difference hasn't changed, we collected our second ever win in Bourges, and just like the first time, it means that we are through to the FINAL4 (40th minute 64-74)! Roberto Iniguez: It is hard to speak now! When I came here to Sopron two years ago and we were talking about the goals with the GM, he said that he hopes that by the end of the second year we could make it to the last four teams of EuroCup. To that I said that I have been fighting for big Euroleague goals all my life, and that'S why I came here, too. Now we can say that we have made it to the four best teams in Europe in two consecutive years! It is an incredible experience! I am very proud of my players, this is the best season of my life! I've had more teams of better quality, but they haven't believed in the work this much, and the players haven't worked as hard as they do at this club anywhere else. 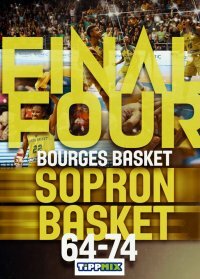 Congratulations to Bourges, too, they would have deserved to reach the FINAL4, too. I offer this FINAL4 to our Managing Director, who couldn't be here with us! Zs�fia Fegyverneky: We are so happy that we have made it to the FINAL4 with this win! We haven't even realized that we did it twice in a row! In today's game we showed that we can play better than we did in Sopron! We corrected our mistakes and overcame our opponents in tactics as well. There were also some extra performances. I want to mention Tina of all. She gave the team the extra boost we needed very much. We are very happy and thankful for the fans who were here today. It was fantastic to hear Hajr� Sopron in the Bourges arena, especially at the end of the game!